Injuries have derailed the Seattle Mariners in recent years, and they hope history isn’t about to repeat itself. Second baseman Robinson Cano left Sunday’s game after being hit on the hand by a pitch from Tigers pitcher Blaine Hardy. Cano left the game immediately, and before the game was over, the Mariners announced that Cano had fractured the fifth metacarpal in his right hand. There is no timeline for his return at this point. Cano will visit a hand specialist on Tuesday. At that point, he’ll know more about how much time he may miss. 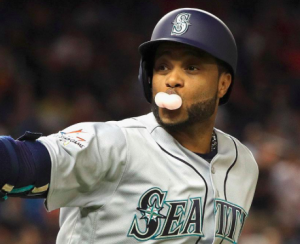 Surgery has not been ruled out, a route that could keep Cano out until the all-star break. Either way, it’s a safe bet that Cano will be sidelined for a significant period of time. Cano, an all-star in seven of the last eight seasons, was in the midst of another productive season. Despite his power numbers down from past seasons, Cano is currently hitting .287 with an OPS of .822. Outside of Mitch Haniger and Ryon Healy, he’s been Seattle’s best offensive player. Unfortunately for the Mariners, they don’t have an obvious replacement to step in for Cano. Utility man Austin Romine has started four games at second base this season. But he’s not a natural second baseman. He’s also hitting just .167 this year. Utility man Taylor Motter could be called up from triple-A to split time with Romine. But he’s a .198 career hitter in the majors. Veteran second baseman Gordon Beckham is also playing for Seattle’s triple-A affiliate. He’s not on the 40-man roster, but the Mariners may prefer to Motter because of his experience. Of course, Beckham is only a career .239 hitter across parts of nine season in the big leagues. Another option for the Mariners is moving center field Dee Gordon to second base. Gordon, of course, is a natural second baseman who made the move to the outfield this season. However, Servais was quick to say Sunday that Gordon would not be switching positions. While Gordon would have solved Seattle’s vacancy at second base, the Mariners don’t have the outfield depth necessary to make that move. Moving Gordon to second base temporarily would mean both Ben Gamel and Guillermo Heredia would have to play virtually every day. Heredia has been productive offensively in a part-time role. But Gamel is hitting .173 on the season. Regardless of who fills in at second base, replacing Cano will be virtually impossible to do. He’s still one of the best second basemen in the American League. Unfortunately, the Mariners don’t have any infield prospects waiting in the wings ready to replace him. To this point in the season, Seattle has stayed close to the Astros and Angels at the top of the AL West. But surviving a month, possibly more, without Cano will be a great challenge for the Mariners.